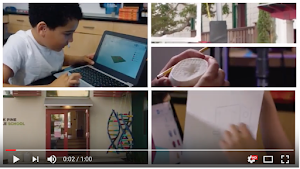 A blog intended for, and often written by, my middle school students, as well as anyone interested in the fascinating potential of 3D printing and the process of getting there. 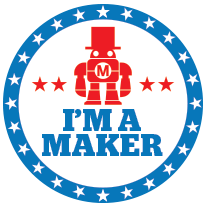 Click the "Our BPC Story" blog label to learn more about our Maker Club journey. As we are nearing winter break and are in the midst of the holiday season, we decided to build a three-dimensional, recyclable, life size Christmas tree, because, well, why not? 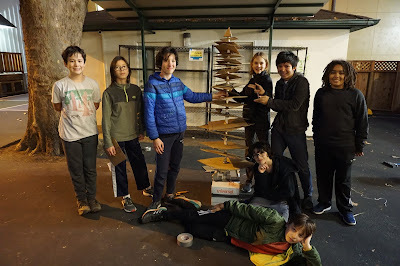 At the start of Maker Club on Thursday, December 13th, Ms. Mytko gave us a 6 foot PVC pipe and told us to make a tree. It involved a lot of trial and error, and at the beginning we were very disorganized. We had about 8 people working on the tree. 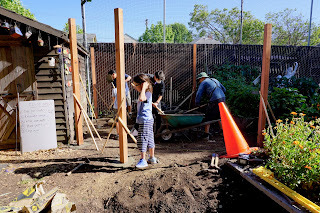 About 2 or 3 on making the base structurally sound, 1 person on making the pyramid on the top, 2 people on making squares, and a couple people milling about, unsure about what to do. As time continued, we slowly became more organized. 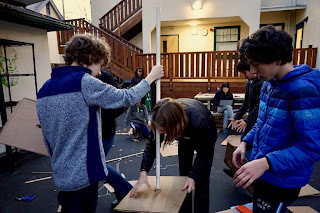 We had two people on cutting squares, and three people on cutting holes in the center of the squares so they could go onto the PVC pipe. We couldn't possibly cut holes in flat cardboard slabs fast enough, until Ms. Mytko came by to give us a suggestion. We cut little x shapes into the center of the cardboard like little flaps and the forcefully shove them onto the PVC pipe. Then we really got into motion. WE had a whole system. One person cutting more squares and passing it to another 2 people finding the midpoint of each square, and us passing those to 2 other people to cut the squares, and then finally, to the last person who tested them on the tree "trunk." By this time, it had started to grow dark and we hadn't put anything on the tree yet, so with help, we lined all the squares up from biggest to smallest and applied them to the trunk. After around ten minutes of forcing cardboard on pipe and duct taping (of course) everything for structural support, we topped it with the pyramid and admired our work. Someone put the first cardboard ornament on the tree! 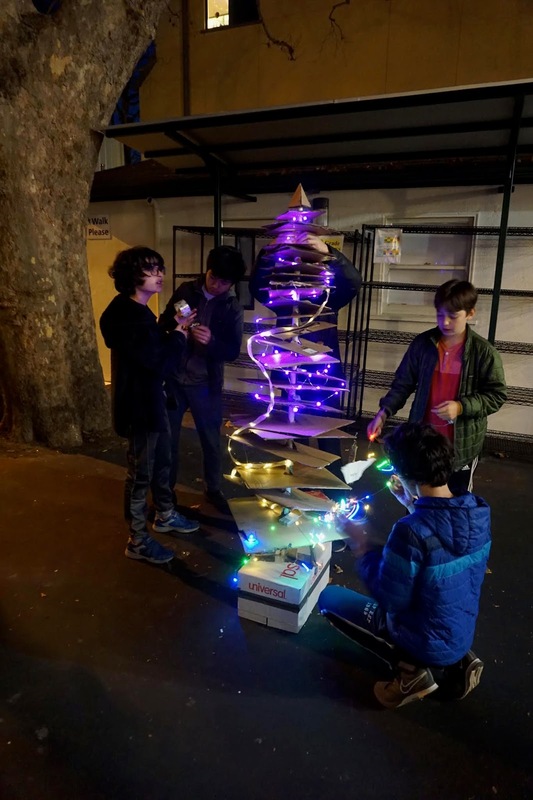 We threw some fairy lights on it to add to the effect and our Maker Tree was complete! 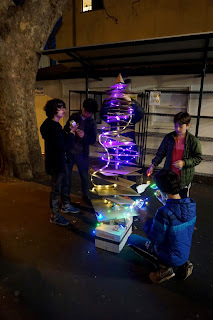 In Friday Maker Club, people made more ornaments for the tree and hung them up! On 11/8/18 and 11/9/18 another kid and I made a Ritz cracker speaker. The outside is a normal Ritz box with letters cut out but the inside has two smallish speakers. We were hoping to make it Bluetooth although the thing we were using (sonicIQ) although we didn't get it to work. Although the sound is slightly muffled in my opinion it works great. There is a whole on the bottom to let the power cord through and the hole for the heat sync but other than that it looks like a regular Ritz box with negative letter spacing. 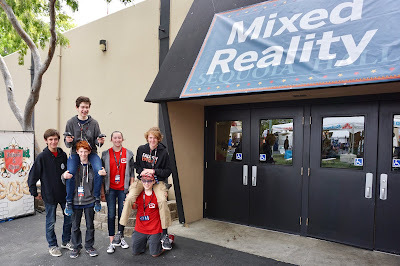 One week ago, we loaded our rented van with kids, chicken crafts, and our HTC Vive, and headed off to the San Mateo Maker Faire. 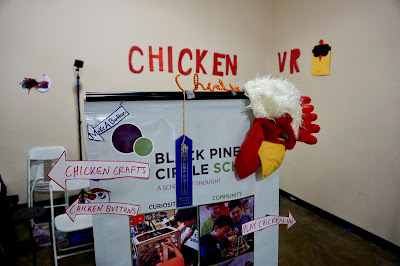 Sunday night we returned with far fewer button-making materials, tired and happy kids, and an Editor's Choice blue ribbon for our project, Chicken VR! At Black Pine Circle School, we're obsessed with chickens. In the science room, there is a chicken calendar, multiple chicken posters, and each of our non-Chromebook computers are named after chicken breeds. The 7th grade science class hatches chickens just about every year, but these birds usually are returned to the farm after a couple of weeks. 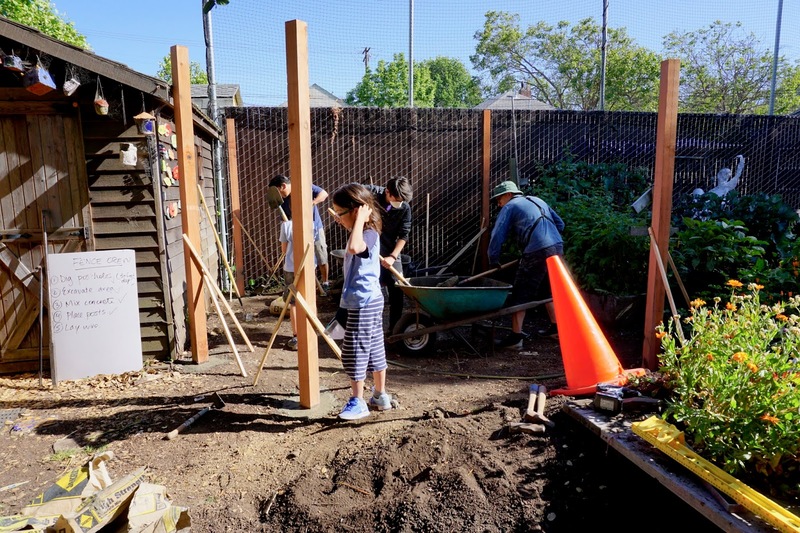 Until last year, when the garden educator and some students got together to build a chicken coop. After a 2017-year end ceremony, we now have chickens living on campus. 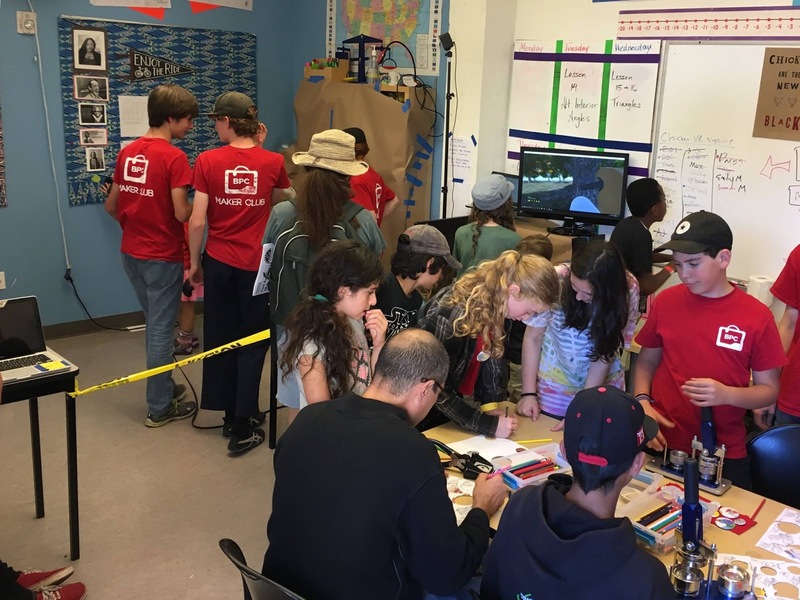 When we were brainstorming for East Bay Mini Maker Faire, we wanted something chicken-related, but also tech-related, with a maker element. We had recently bought our HTC Vive (a few months ago) and wanted to learn more about developing software for it. This is how we got the idea for Chicken VR. It's a first person chicken simulator in virtual reality. You can walk around, eat, drink, and lay eggs. Our first step was research. As with any good project, we wanted to see what was already out there. 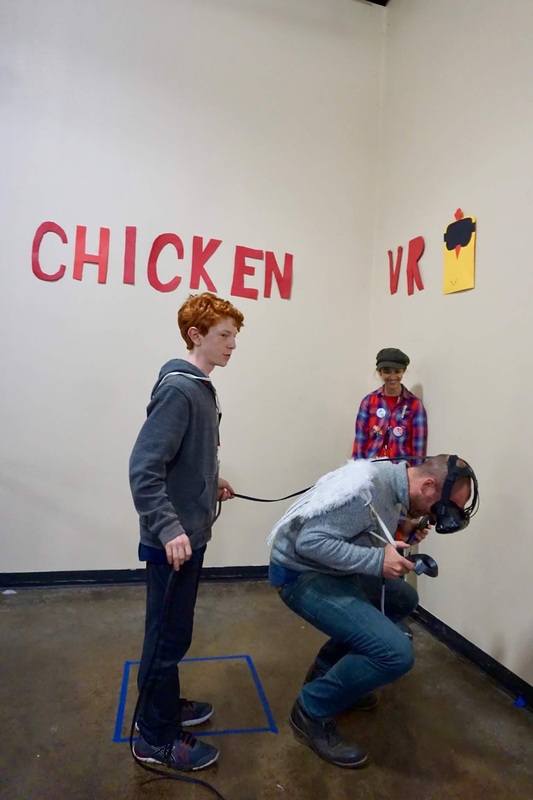 We searched the Internet and was momentarily crushed to discover that a Oculus Rift Chicken Simulator already existed! Though it has some really interesting features, we knew we wanted to personalize our first-person chicken experience to match our chickens at BPC. Plus, the Vive would allow users to walk around in real space, instead of having to sit in a chair. 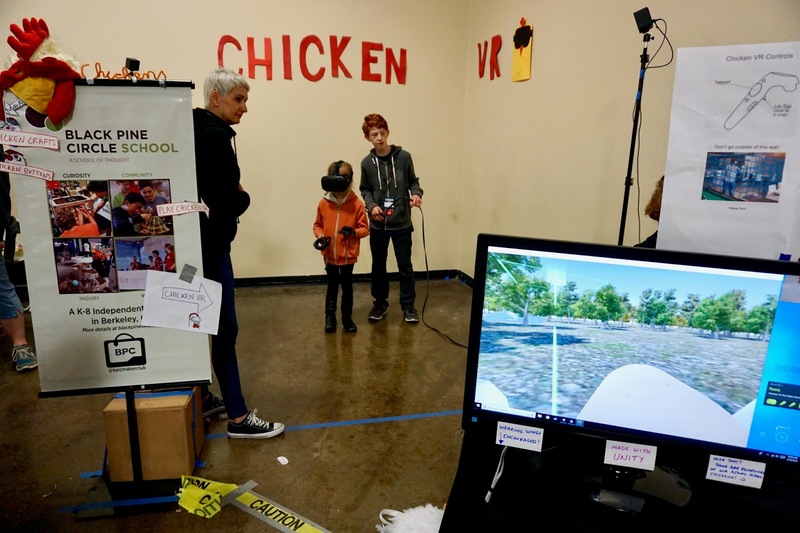 Another project, Second Livestock, from Iowa State University assistant professor Austin Stewart "imagines how VR goggles could make chickens believe they’re free-range, even when they’re not. 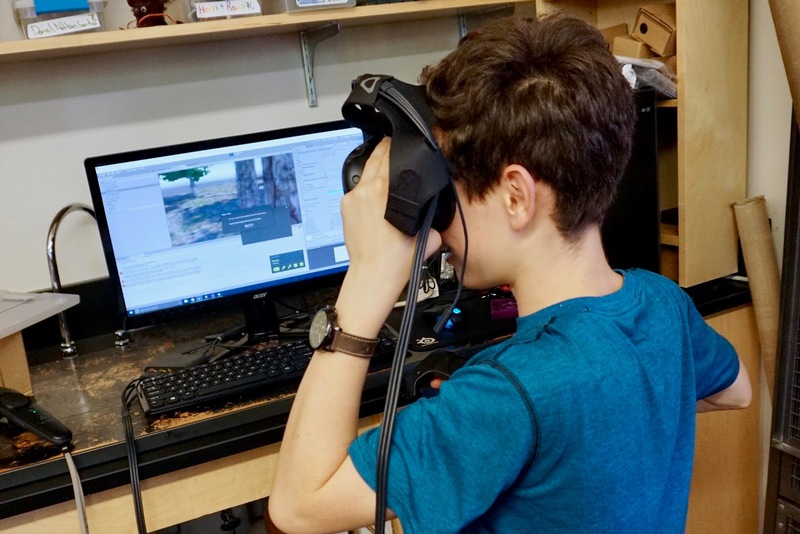 They can explore a virtual grassland, and with future iterations of Oculus, even peck at the ground and bob their heads around to take in the landscape at different angles." (via TechCrunch) Strange, right? There is also a Virtual Chicken Coop, "the most realistic chicken coop simulator on scratch, currently featuring 10 different breeds of chickens!" But, we believed we had something different. 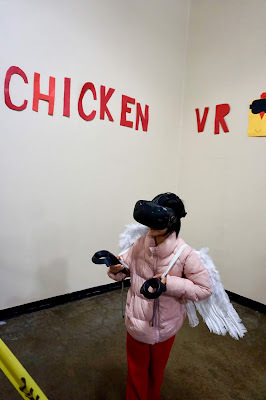 Besides, can there be too much Chicken VR? 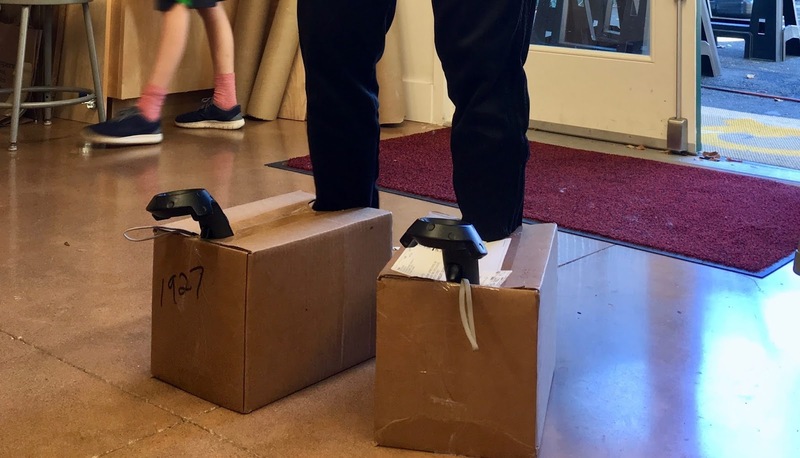 Originally, we brainstormed a design where the trackers would actually be your feet. However, we realized that if we wanted users to teleport, this presents a problem. We thought about getting four controllers, and eventually settled on the design with two controllers held in hands. We used TinkerCAD to create the wings out of simple shapes. These wings are attached to the controllers and you can flap and teleport. 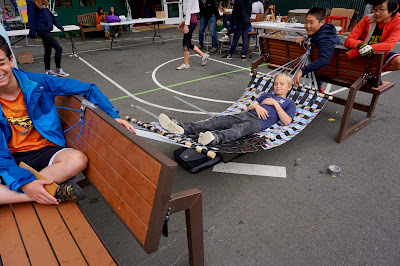 We used Fusion 360 to create the virtual model modeled off our actual school coop. Finally, we used Unity to design the environment, adding terrain and taking full advantage of the "Mass Place Trees" button before applying various textures to complete the look. 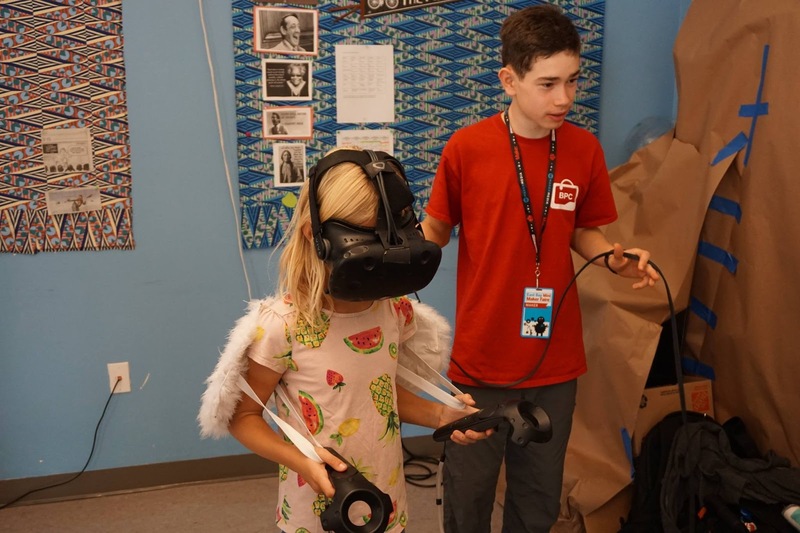 We worked on the physics of the wings and eventually added rotation to body movement and made sure the body resizes based on head height to accommodate a wide range of users. We added teleportation and a health, water, and food system with HealthTracker script. In Chicken VR 1.0 (which we brought to the East Bay Mini Maker Faire) when the beak touched food or water, your scores would increase and there was a dehydration timer involved as well as a health loss if food or water is empty. 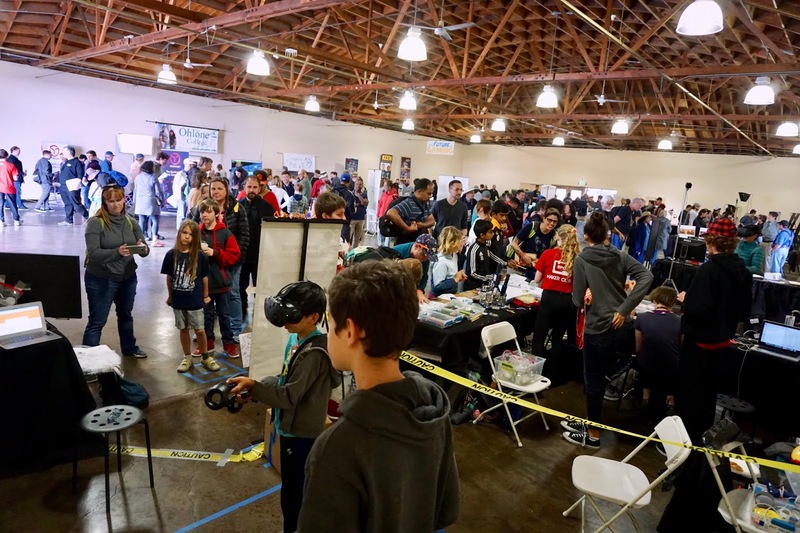 Before Bay Area Maker Faire (a few weeks before), we removed the health, food, and water tracking systems and added some new features. Now you can lay eggs when you pull the trigger and fly. There's even a purple hand that follows you around and feeds you a worm periodically. There are new sounds, which include "chicken eating," "chicken drinking," "chicken background," "slurp," and "flap." 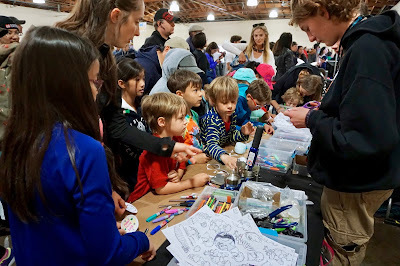 Besides Chicken VR (which often had long lines) the maker club kids had additional chicken crafts available. 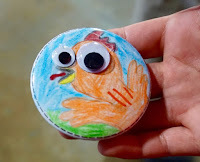 People could make chicken buttons, or other chicken-related crafts. The button backgrounds came from a coloring book titled Exotic Chickens: Coloring for Everyone (Creative Stress Relieving Adult Coloring Book Series). The button machines were, as usual, a big hit with kids and adults alike. We had a great weekend helping people experience what it might be like to be a chicken. I saw this YouTube video yesterday and decided to try this--a process to engrave in almost any type of metal using salt, vinegar/water, and electricity. It takes some experimenting to get right, and you have to use the right kind of battery, but otherwise it works pretty well. We learned in our first attempt that it won't work on lids for mason jars, because the surface isn't conductive. You'll want to test for conductivity on your material before you try to do anything. We were initially misled, because it "worked" the first time. In reality, water had leaked under our stencil, completing the circuit. Once we made a tighter seal (by using sticker paper for our stencil), it was no longer conducting anything and no longer worked. Eventually, I successfully engraved in a sheet of stainless steel using a 12v battery. Soak some Q-Tips in a mix of vinegar and salt. You can also use water with just salt but it won't be as strong. The amounts don't matter but you can watch the video (1:28) to get an idea. You need a power source. We tried using a bunch of 9v batteries but found that this lead-acid 12v battery worked better. 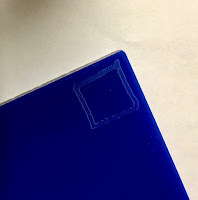 I laser cut a name tag onto transparency paper with a stencil font and stuck it on with some blue tape to prevent the liquid from leaking around the stencil, but you can also use sticky stencils or something else. The video also shows how to use stickers and nail polish to make more complex shapes. Connect one end of the battery or power source to the metal and one end to the end of the Q-Tip, making sure the alligator clip on the Q-Tip won't touch the metal surface. Put the Q-Tip on the metal in one spot for around five seconds and then move it to the next spot. It makes a bubbling sound and some smoke. I wiped any liquid off of the surface after each letter. Also, that YouTube channel is great for other DIY projects and car work. Back in October 2015, we pre-ordered the Glowforge. We, and other Glowforge potential owners repeatedly received delay-of-shipment emails, to the point where many people began to jump ship. The space had been taped off for so long and it had become a joke. Someone wrote "The forgotten dream," back in 2016, and earlier this year, someone else added "We will love love u and cherish u what scared u away?" We still don't know who wrote these messages. And then, we received "the" email. Sunday, November 5, we assembled for the unboxing. We made the same mistake we make every time we open a box with something expensive in it: we cut the tape and then realized we had opened it wrong. We carefully turned it on its side and took the laser cutter out. Looking at the unboxing guide, with the link conveniently located inside the box, we found that we shouldn't have even cut that tape. Once we got everything out of the box, we removed the protective foam and assembled the "print head." We cut out some cardboard to seal the window we were venting the exhaust through, and set up a table near the window. Then we plugged it in and turned on the machine. It worked as expected, making some bubbling noises from the water-cooling system. 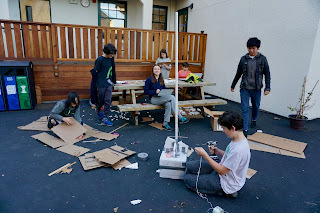 The setup process was super simple and only required us to connect it to the school's WiFi before we could start making things from their web based software (that can run on a Chromebook!). Someone drew a simple not-so-accurate square on a piece of paper and placed it in the machine so that we could scan it. We scanned it and then put some acrylic in the machine. When we went to cut, we ran into a problem. Here's the thing: the Glowforge was so popular because of how easy it is to use. In order to make it this simple, they made their own material presets. These material presets are only for their "proofgrade materials," which means we can't cut with our own materials. They do have a way that you can set it yourself, but the controls are very ambiguous and you can't save presets. We also didn't have our introductory proofgrade material kit, it came the day after. Each month, we are excited to see what new filament comes in our Maker Box. This month, we received some NinjaTek Cheetah flexible filament, which is pretty exciting. 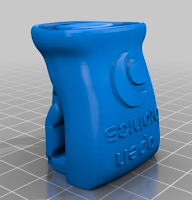 Since we were experimenting, we went on Thingiverse to find something cool. We downloaded the file Miniature Robotic Hand for NinjaFlex by Open Bionics - it prints in one piece! As you can see in the video below, the final product is pretty cool! Of course, what's the next step? Print a BIGGER one. This print used the same type of filament, but was significantly bigger. We learned something surprising! When it is this big, it is too floppy to function in the same way, so the final product was rather dull. Back in April, our Ultimaker 2 Go stopped extruding. This is not unusual. 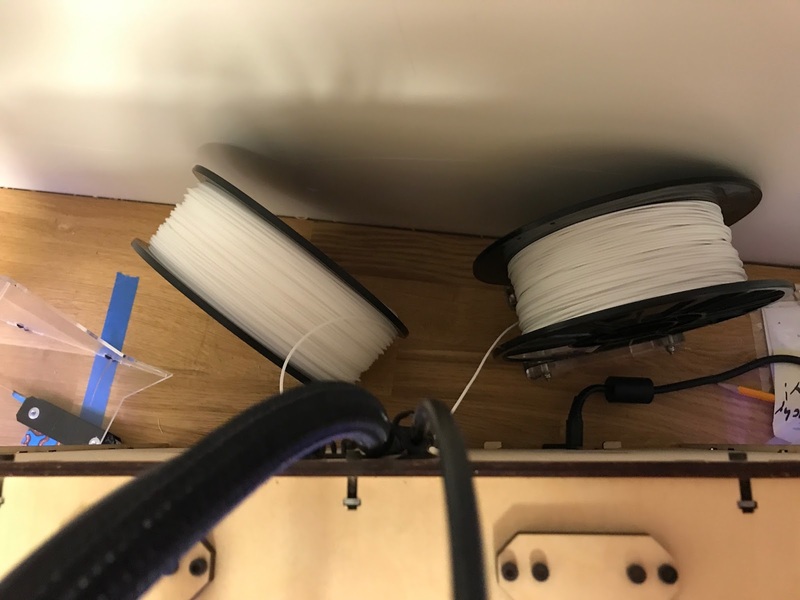 The standard procedure is to take a look at the extruder and maybe unload and reload the filament, checking for errors. 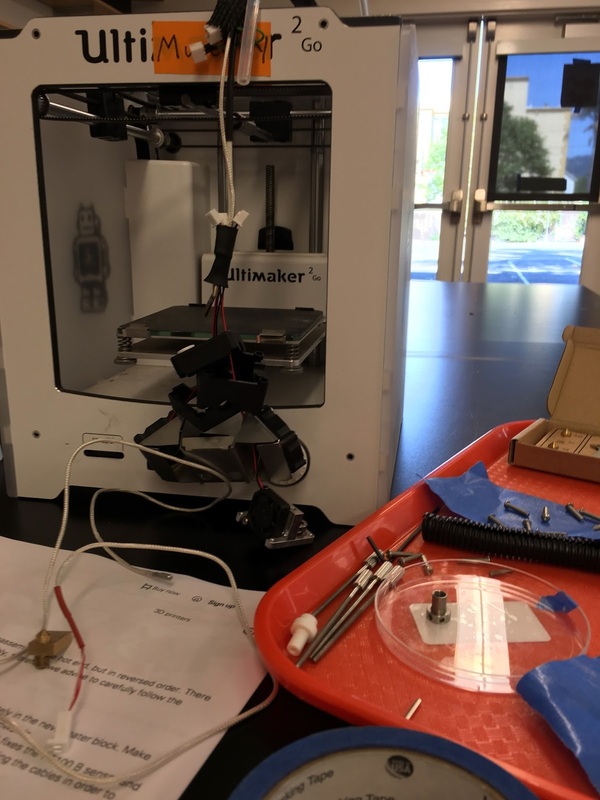 Unfortunately, one of our students decided it would be a good idea to take the entire 3d printer apart. The student took apart the entire extruder and, in the process, broke the temperature sensor and the heater cartage. So, we were left to reassemble a broken 3D printer with very little documentation and no recollection of "what happened." The Ultimakers came with an extra "Hot End Pack," which includes a temperature sensor, a nozzle block, and various other extruder related parts. At first, we thought this would solve the problem. But ends up the pack did not come with a heater cartridge, so we were stuck. 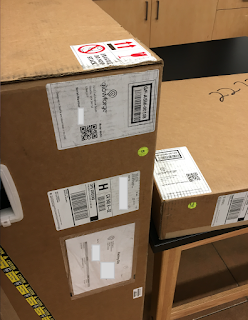 The Dynamism site (where we first ordered the printer) sold only a few, more consumable, parts--and not the parts that students might destroy. 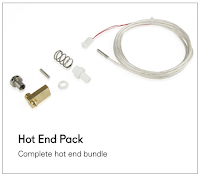 Luckily, Ultimaker support eventually clued us in to the fbrc8 Ultimaker warranty site. This was VERY helpful! We found a heater cartridge and ordered one. 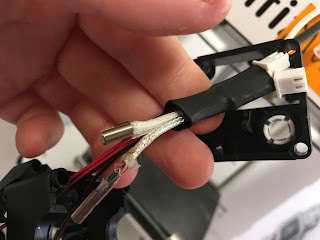 Back in the classroom, we replaced the broken temperature sensor with the one from the "Hot end pack" and the heater cartridge from the fbrc8 warranty site using this fbrc8 resource: Changing Heater Cartridge And Temp Sensor (2GO). We had to open the bottom of the Ultimaker to plug the heater cartridge back in. It was good practice in reading the instructions very carefully! Eventually we reassembled everything and were proud of our efforts when it printed flawlessly once again! On May 26th, BPC had its first official School Maker Faire. (We've done unofficial "micro-maker faires" in the past.) What started as something we did in an after school club three years ago (making) has now fully infiltrated seventh grade science! 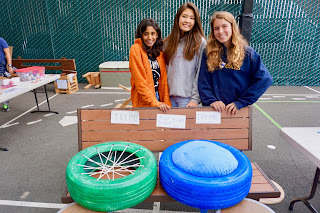 The kids made bath bombs and henna, build a giant cardboard tank and a very tiny metal foundry, constructed a duct tape hammock, figured out dual extrusion, and even turned old tires into seats! For a list of all the student projects, visit our school STEAM blog. I Screen Printed onto old shirts to raise awareness for the LGBTQ+ and mental illness communities. I noticed that representation in the media of the LGBTQ+ community is sparse, and there is almost no representation of people who fight with mental illnesses. Seeing yourself represented in the media can change someone's outlook, make them feel hopeful, and can show them that they are not alone. Lack of representation can isolate groups of people and I wanted to combat this problem with creativity. At first I wanted to make a clothing line, however time and material constraints proved that to be unfeasible so I decided to try screen printing. I had never screen printed before, so I had to learn from Wikihow. I started out by coming up with phrases to ink onto the shirts, for instance “Dear Homophobes; Boo!”. I tried cutting out the phrases, however this was challenging to do with scissors. I decided to try printing it out first, then using an exacto knife to trace the lines. This worked well but it still wasn't time efficient. I finally attempted to laser cut my design, this was not only time efficient but it was also a great learning experience. I cut old undershirts and screen printed my phrases onto them. This project costs around 45 dollars for the baseline materials but it can fluctuate significantly for the unnecessary materials. I learned that it's okay for there to be small mistakes and sometimes those mistakes can improve the style of the shirt. I would enjoy marketing this into a business on Etsy, I will continue to screen print at home and I will possibly sell some shirts. If you are interested in this project make sure you set the ink into the shirt before you take off the screen, this will ensure better quality prints. Don’t give up when the ink smears, or doesn't come off, you can always go over your design with an ink dipped pencil. If you don't focus on the mistakes, but rather on the quality parts of your print, you will end up a lot happier! 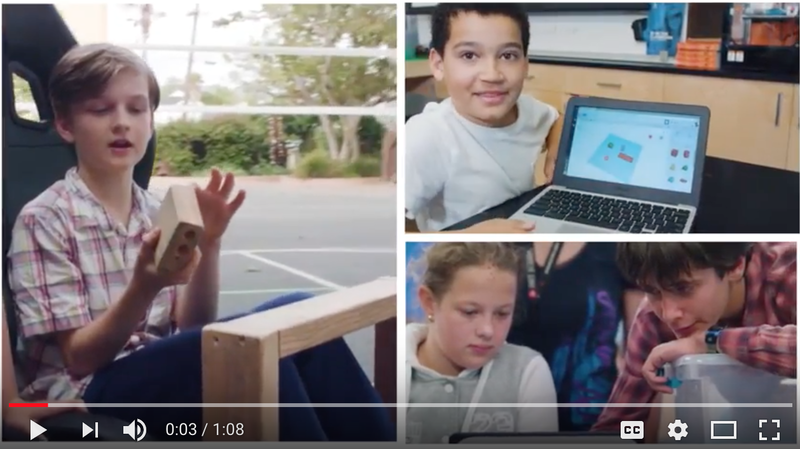 For our school maker project (in science class), we wanted to create something that kids everywhere would be interested in using, and we also brainstormed different ways to spread our creations beyond the school to reach a wider audience. We wanted to use our knowledge of 3D printing. As we saw the rise of fidget products all over our school and all over the country, we realized that we had found our project: we decided to 3D print some fidget spinners that we designed ourselves out of recyclable filament. 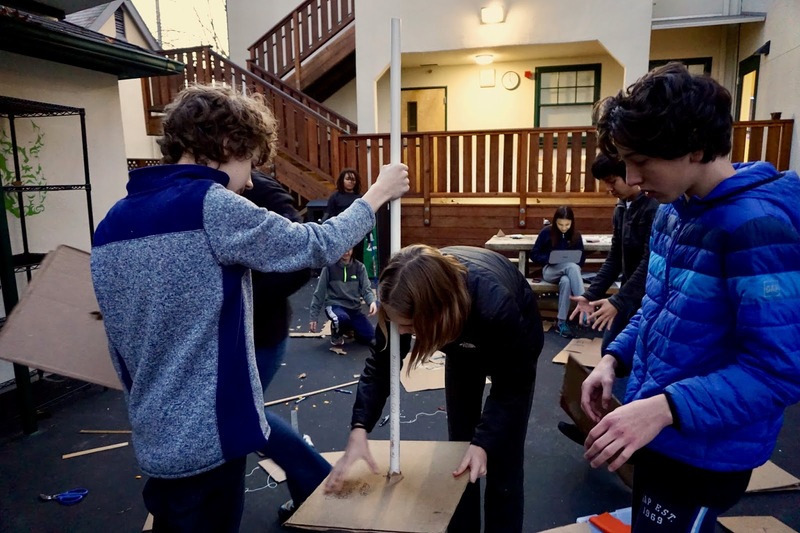 There were some technical challenges that we experienced: for instance, the design we created ended up with some overhangs, which you can see in the image above. To deal with this, we decided to use dissolvable support material to hold them up. We also had to make a decision about what printer to use of the ones available to us at school. We chose to use a Replicator 1st Gen because of its dual extrusion capabilities, and this served us pretty well. 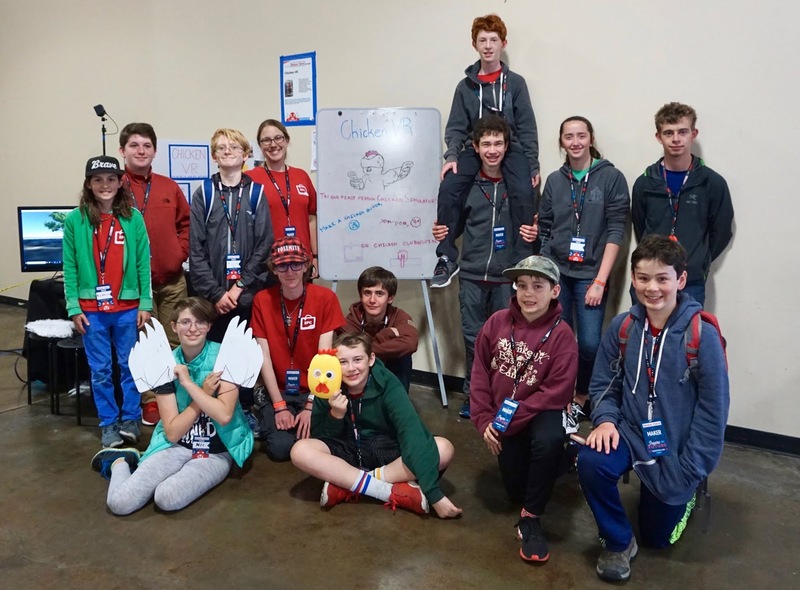 We used TinkerCAD because of its very straightforward design software that all of our group members knew how to use and the fact that we could use geometric shapes very easily along with the community shape generators. To get started with our project, we started out with a simple dual geared fidget because we had no experience making this type of project before. 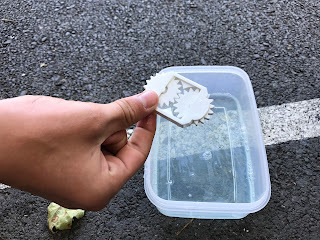 Starting simple was helpful, and we later were able to get more complicated and make things like triple gears and quad gears. One of our greatest challenges was when one part of the 3D printer we were using broke. We were able to re-3D print this part but it was a bit of a hold up. We also had to come up with a way to fix the windows for our 3D printer because our print’s kept peeling and we needed to stop drafts from reaching the heated build plate. Throughout this process we learned not to rely on machines because machine failure is common. We also learned that even if you are using a very baseline software, you can still make amazing creations with it, it just may require more work. If we wanted to continue this project, we could create more gear designs using ball bearings. 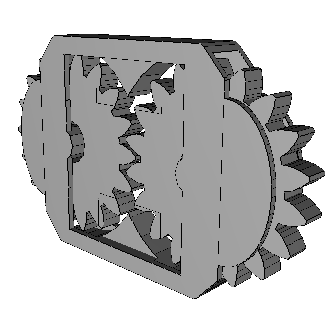 This would be hard though because we might have to not print the gears as one piece so we could insert them, or we would have to put them in mid print. 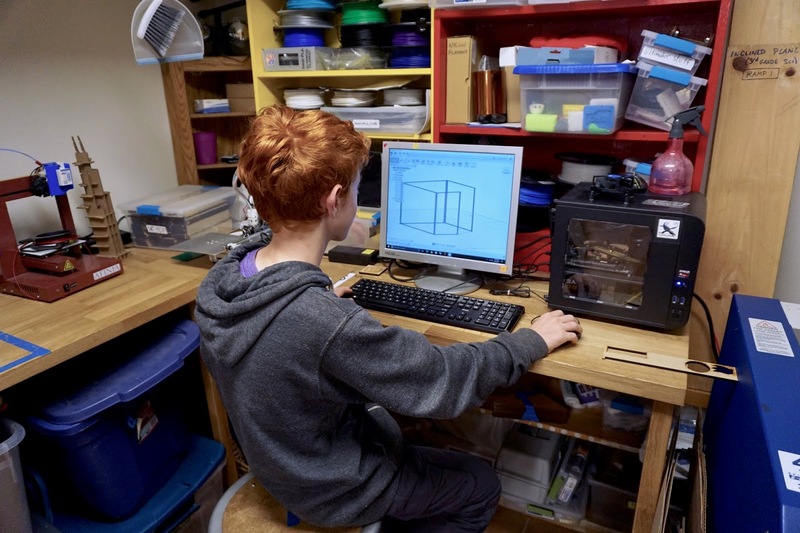 Our advice for other people who do this project is to start early and use a web based software (like tinkercad.com) so that they will be able to access and change their project from different places. An estimated cost of materials in this project (not including the 3D printer) is about $40 because of the fact that the slicer and the design program (Tinkercad) were both free, so the only costs we had to cover were filament (ABS and HIPS) and electricity. This $40 could cover many, many gears, because they are almost hollow and therefore very efficient with the material. To learn more about dissolvable filament check out this on MakerBot’s website. One day while we were waiting for a set of gears to print we chose to make a website at www.thegearmakers.wixsite.com/gearmakers. 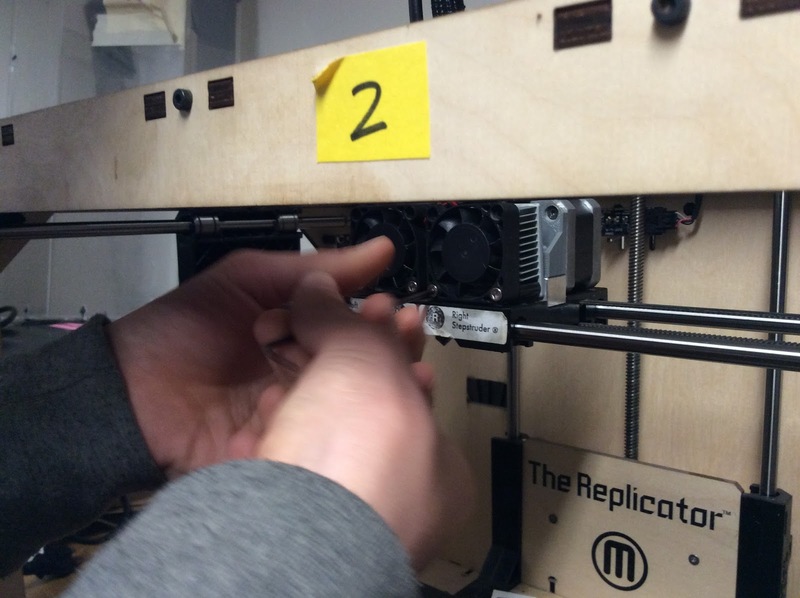 Through our project we had to fix the Replicator about six times and replace some parts. By the end we had created four production lines. And already finished two of them (dual geared basic and dual geared +). We thought that with four different products to choose from we had finally done what we had meant to the whole time, we had finished with our fidget production.